That’s meeeeeeeee. My debut at Caitinara Bar at 12noon slt Sunday 6th March. 2 hours of feel good indie and alternative tunes plus all the usual DJ Kess randomness and fun! 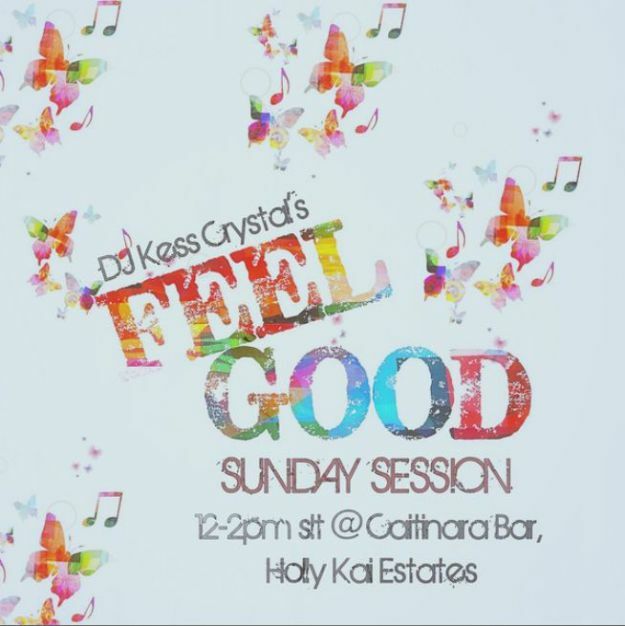 We’re pleased to announce a new 2-weekly event at Caitinara Bar at Holly Kai: Feel Good Sunday Session. Starting on Sunday, March 6th, and taking place between 12:00 noon and 2:00pm every other Sunday, Feel Good Sunday offers you the best in chilled out indie and alternative tunes, with our Sunday DJ Kess Crystal. So why not don something casual and head over to the beachside bar at holly Kai and join us in welcoming Kess to Caitinara, and enjoy some great tunes? Your hosts for the afternoon will, as ever, be Caitlyn and Inara Pey. Limo below! This IS how I woke up…but it’s not how I look now!